The event includes, screening an international documentary film on the issue of rising Antibiotic Resistance infections, to be followed by a panel discussion on the Antibiotic Resistance scenario in India. 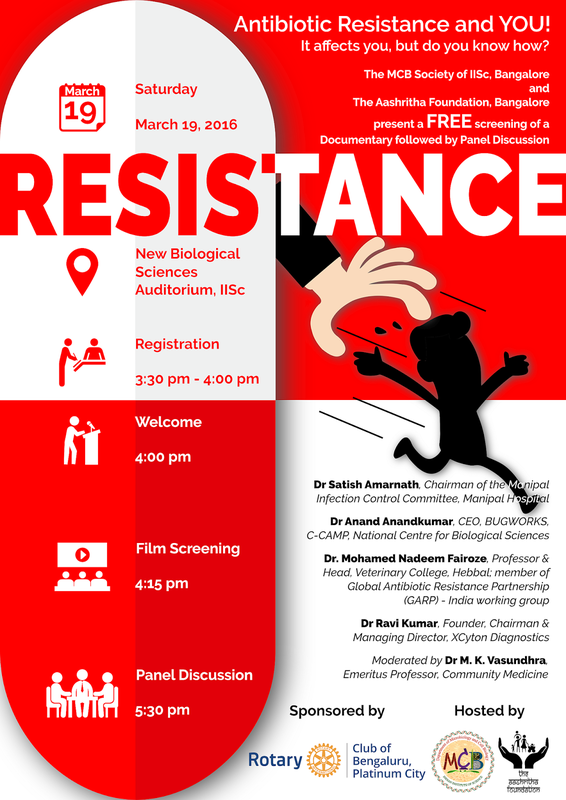 The film, Resistance (http://www.resistancethefilm.com), being screened for the first time in India, has earlier been screened across the North America, Europe and Africa garnering festival awards and great press along the way. The film was called “Lucid, superbly filmed and galvanizing” by The Washington Post, “The Movie That Will Make You Care About Antibiotic Misuse” by WIRED, and “gripping” and “engaging” on Slate. The panel discussion will bring together experts involved in: antibiotics discovery, diagnosis of antibiotic resistant infectious diseases, prescription and consumption; to discuss with the common public, about why Antibiotic Resistance affects all of us. It aims to give everybody a glimpse into the ground realities of Antibiotic Resistance problem existing globally and in India, and how we can collectively move together, to use these mainstays of modern medical practice, wisely and rationally. The panellists include Dr Anand Anandkumar (CEO, BUGWORKS Research Pvt Ltd.), Dr Satish Amarnath (Medical microbiologist and Chairman of the Manipal Infection Control Committee, Manipal hospital), Dr Ravi Kumar (MD, Xcyton Diagnostics) and Dr Nadeem Mohamaed Fairoze (Professor and Head, Veterinary College, Hebbal). The panel discussion will be moderated by Dr M.K. Vasundhra (Emeritus Professor, Community Medicine). The event is meant for the common public: for anyone who has ever Or never used an Antibiotic. Antibiotics, the miracle drugs, were a boon to the medical world and made possible surgeries, transplants and chemotherapy possible. However, with the rise of Antibiotic Resistance infections, Antibiotics are fast losing their efficacy in treating infections not only in humans but also animals, making Antibiotic Resistance a global health concern. In recognition of the growing concern about this problem, Director-General, World Health Organization (WHO) Dr Margaret Chan stated in 2011, “No action today means no cure tomorrow” and WHO also started the first World Antibiotic Awareness Week campaign between 16th to 22nd November, 2015. A study published in Lancet showed that more than 58,000 new born babies died in India in 2013, because they were born with antibiotic resistant bacterial infections. “A doctor would be helpless to save a patient if he is not armed with antibiotics. The dooms day scenario is not far if we do not use antibiotics judiciously,” says Dr Satish Amarnath, one of the panellists, for panel discussion. In addition to indiscriminate use of antibiotics in human health, antibiotics are also abused in the veterinary sector because of their non-therapeutic use further facilitating Antibiotic resistance. Cancer is one of the most dreaded diseases today. However, a British research review concluded that drug-resistant infections will cost the World 10 million extra deaths a year (more than Cancer) and up to $ 100 trillion by 2050. Awareness amongst different stakeholders - consumers, pharmacists, doctors including veterinarians, dairy cooperatives, pharmaceutical companies and policymakers, is the need of the hour! The change is needed at each and every level. The question is have we reached a point where we must save antibiotics in order to save ourselves? In a bid to raise public awareness on the consequences of antibiotic resistance, a play has been produced to bring the message to the society. The Vaidya's Oath portrays the global problem through a range of characters representing the different stake holders in this problem: a pharmacist, doctor, a patient and the pharmaceutical company. 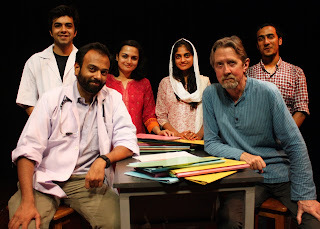 The 80 minute English play, directed by Jeff Teare, written by Gautam Raja through the collaboration of Jagriti Theatrescience and the National Centre for Biological Sciences and supported by a Wellcome Trust Grant, explores the multiple dimensions of the issue. It addressed the corruption, ethical issues with clinical trials, dilemmas of the medical fraternity and the plight of patients though its characters and the unique plot. The play is currently being staged in Bengaluru. While theater has been traditionally used as medium for social change in India, picking up a health issue has been uncommon and certainly never for antibiotic resistance. It is a novel venture using theater to build awareness on a critical health issue that while has garnered media evokes limited space in public discourse in India.